Summary: The mystery behind stuffing your bass drum revolves around the idea of airflow control. 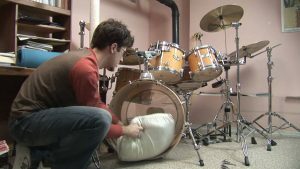 Muffling your drum goes much deeper than simply stuffing your bass drum with a bunch of pillows. It’s an art. Adding the perfect amount of muffling to any drum to obtain the best sound is actually quite difficult, but crucial to drummers. Muffling allows you to control the amount of resonance on your drums as well as controlling the tone of certain notes. The bass drum is ideally the first drum that every drummer muffles. It has become a popular habit due to the fact that the bass drum carries a significant amount of resonance. Because it’s meant to be powerful, most drummers put something inside the drum to dampen the noise. One of the most ideal methods to muffle your bass drum is to go out and purchase specific bass drum muffling products. Now, they range in prices and quality so be sure that you’re prepared to spend some money. However, if you would rather skip this step don’t worry, there are a variety of options to consider that’ll give you similar results. Remember, the whole point of muffling is to control the airflow in the shell. If you instead fill the entire drum with pillows and stuffing, you’ll completely cut off all air flow. One of the best materials to use, if you’re on a budget, is foam. You can cut it, shape it, and practically do whatever you want to it and still make your drum sound great. Another part of the set that you might want to consider muffling is the snare and tom. Now, the concept might be similar to that of the bass drum but the method is entirely different. First off, you don’t want to stuff these drums with blankets and pillows but rather utilize different pieces of equipments like drum rings for example. They’re specifically designed to help muffle a set and they actually do it pretty well too. Blog submitted by The Foam Factory: For the finest foam products for your bass drum, outdoor patio cushion set, and more, visit The Foam Factory today.